Elizabeth Cave testimonial. When I began my training in acupuncture with Bodyharmonics I was already a qualified Shiatsu therapist. After a number of years I found myself less enthused to practice, not because of the therapy itself but simply by the strain it was putting on my own energy (and my knees!). During my initial training I developed a great interest in Traditional Chinese Medicine and so decided that acupuncture was the way forward. Having researched many other courses at universities and specialist schools, I eventually spoke to Maria to discover that this course provided a very natural progression from one therapy to the next while not presuming to take over as a form of therapy. The use of tui na or shiatsu alongside the acupuncture in clinical practice is actively encouraged, where appropriate. TCM and traditional needling techniques are paramount in Maria’s teaching. The acupuncture course is structured in such a way that the learning from both an academic and a practical perspective consistently builds upon strong, repeatedly reinforced foundations. With each weekend the students’ knowledge and needling skills are gradually expanded. Having progressed through the usual academic route of school examinations and degrees, I can confirm that the teaching is to a very high standard. The learning environment is relaxed yet lively and all the teachers clearly have so much enthusiasm and genuine love for their subjects that this is one of the best courses I have ever attended in terms of sheer fun! While a grounding in TCM is undoubtedly an advantage it is not an absolute pre-requisite. 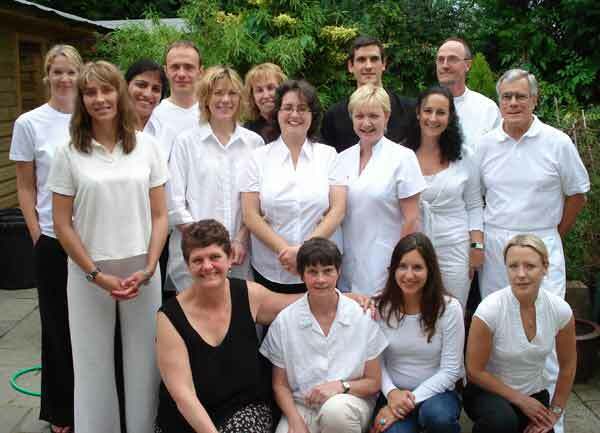 Although passionate about oriental medicine in its many forms, Maria is very open to other areas of expertise and my course found a healthy mix of medical professionals from many different backgrounds.